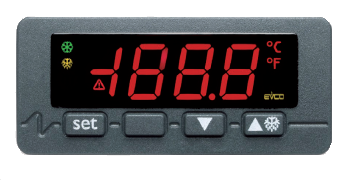 EVK is a range of one (EVK 401/411/421/402) or two outputs (EVK 412/403) configurable digital universal regulators able to work in a working range between -100 and 1300 °C. EVK402/403 models have got one more alarm output. compressor) when configured for "cooling" regulation. relative working setpoint, with "neutral zone" or with "steps". probes, 0/4-20 mA transducers 0-10V / 2-10V), to the availability of different power supply and to temperature reading scale configuration (°C or °F), these controllers can be defined "universal devices for temperature control". EVK421 and EVK402 models also have a multifunction digital input configurable for load protection, Energy Saving or alarm activation. 1 universal for "J" or "K" Tc, PTC or NTC or 2/3 wires Pt 100 / Pt1000 / Ni 120 probes, 2/3 wires 0/4-20 mA transducers 0-10V / 2-10V (not available for EVK401). 1 Output: Load (16A res. @ 250 VAC relay) Alarm (8A res. @ 250 VAC relay) EVK402 model only. 2 Outputs: Load 1 (8A res. @ 250 VAC relay); 16A res. in the multiprobe vers.